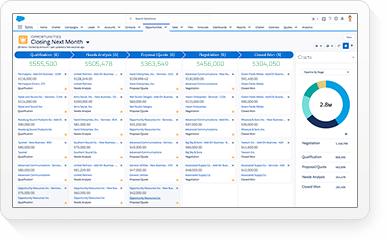 See what’s new with the Salesforce Platform. Build together and deliver continuously. Explore our collection of products and services that bring modern software delivery practices to developers on the Salesforce Platform. 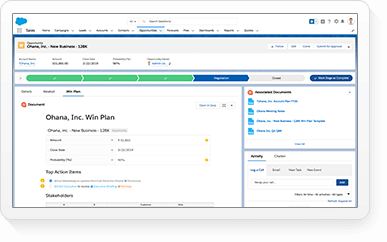 Whether you’re an individual developer or working as part of a large team, Salesforce DX provides you with an integrated, end-to-end lifecycle designed for high-performance agile development. And best of all, we’ve built it to be open and flexible, so you can build together with tools and practices you know and love. Transform connected products into engaging customer experiences. 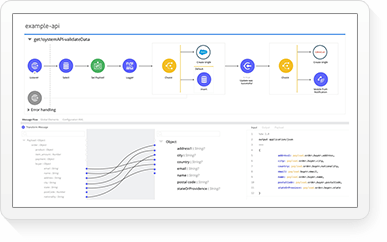 Built natively on the Salesforce Platform, Salesforce IoT Explorer lets you use the data generated by devices to create new experiences, business models, and revenue streams. Connected devices generate data that can create sales, service, and marketing opportunities. Real-time interactions can create a new type of engaged experience. Get big data computing for the Salesforce Platform. With Big Objects and Async SOQL, now you can store and query massive volumes of data directly within the Salesforce Platform. Big Objects make it possible to keep billions of records on the Salesforce Platform, orders of magnitude larger than what was previously possible. Async SOQL allows you to combine Big Objects data with your core CRM and Platform business data. Encrypt sensitive data at rest while preserving business functionality. If you want more encryption coverage for your data then we’ve got you covered. Now you can add another layer of security to PII in Leads, Accounts, and Contacts. 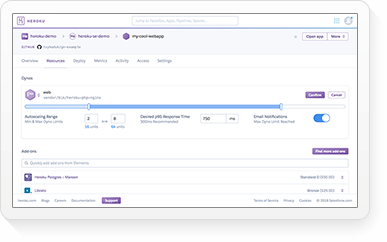 Encrypt data posted on your Chatter feed, access encrypted data with Flows and Process Builder, and track encryption key management in Event Monitoring logs to help meet auditing, compliance, and security requirements. Use Heroku Connect for global geo co-location. Heroku Connect is a cloud-based data synchronization service, where service performance is tied to geographic location. With the addition of four additional geo regions, Heroku Connect now helps improve speed and performance for customers in six regions across the globe. Drive smarter insights and impress with new story visualizations. Drive smarter insights and impress your internal stakeholders with new story visualizations in Einstein Discovery. Einstein now automatically suggests improvements to your data model so you can surface the best answers, explanations, and recommendations. View your insights in a story generated with just one click. 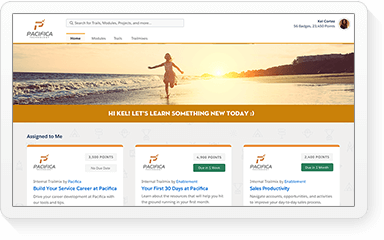 With the new Story Timeline feature, you can clearly see how your business will change over time, allowing you to work smarter. Unlock all your customer data. With Connectors, you can easily integrate data from Salesforce and third-party web-based stores, all without having to write a single line of code. And with Smart Data Prep, Einstein intelligently suggests the right transformations to make in your data, and helps guide users in creating the best datasets no matter your technical ability. Bring the power of Einstein Analytics to every app. 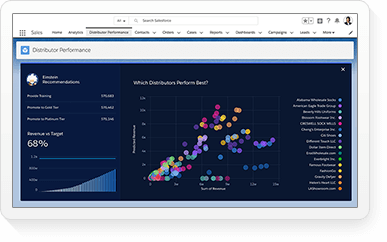 Now you can extend Einstein Analytics to every part of your business. The SDK ensures that apps are easy to create, and provides a seamless integration between Analytics and Force.com. 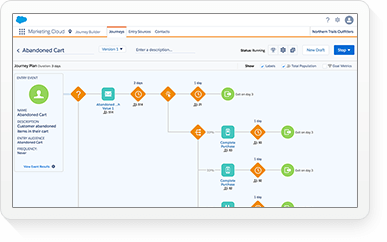 Use the power of Einstein Analytics with your existing apps, or even take it off-platform to use in remote apps. Never miss an update with notifications, now in the Analytics mobile app. Be productive on the go with notifications pushed to your Analytics mobile app. Stay on target with goals and monitor how your business is tracking with the same benchmarks you set in the desktop, synced directly to your mobile device. Get a quick glance of your most important KPIs, and easily run your business from wherever you are. Leverage CMS content to create a beautiful community, faster. 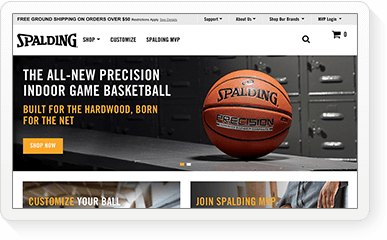 Personalize every user’s experience with a tailored look and feel, branding, and content. Create personalized experiences for every user. Using CRM data, you can target different audiences with unique content. You can also tailor the branding, theme, and content of a community space for a specific visitor. For example, surface different content for a distributer than a reseller. Or deploy a community for customers and support multiple brands in your portfolio. 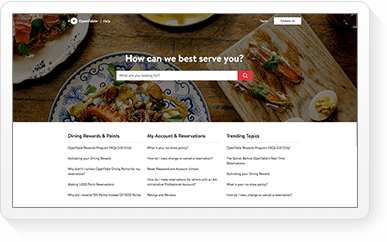 Find new ways to engage customers across portals and communities. It’s easier than ever to drive community engagement. Community managers have the Engagement Queue to filter for new members, MVPs, and more. Members can use emojis to add fun and sentiment to conversations, and streams to create personalized content feeds. 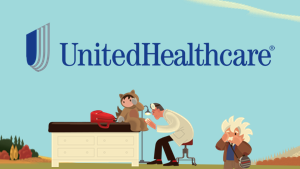 Service agents have Community 360 to get a complete view of the customer to provide better, more prescriptive answers. Streamlined legibility, density, layering, and contrast. Lightning Experience has been infused with Trailhead fun. Lightning is easier to read, with clear hierarchies between text box headers, body, and buttons. It’s easier to see, with more compact design that allows for greater density and more efficiency when you work. And, it has higher contrast and depth between elements, making it easy to see and interact with components and their constituent parts. Accelerate app development with over 25 new components. 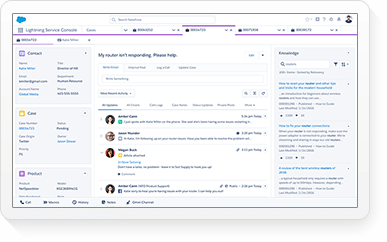 Winter ’18 is a major release of Lightning components for the Salesforce developer and admin community. We are delivering over 25 new components for use by our developers and admins to accelerate app development and customization. Unit test your custom components to perform quickly and accurately. Now you can conduct unit tests on your Lightning components to understand their performance and downstream impacts. Lightning Testing Service helps ensure you build and customize with confidence. Admins can now deliver more personalization for every user. With Dynamic Lightning Pages, admins can declaratively build better experiences with more control over what end users see. Use component properties to make a component appear or disappear depending on workflow or related values. This means targeted personalization for every user. Get more flexibility than ever on page layout and structure. 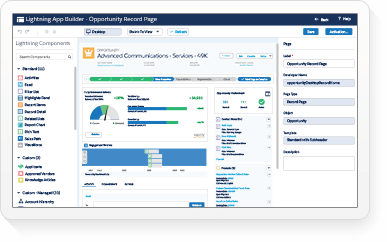 Go beyond the templates Salesforce provides for home pages, record pages, and console apps. Developers can create any custom Lightning page template they need, so you can provide your team members with any page layout they need to succeed in Lightning Experience.